I don’t know if it is because I’m getting older but I cannot believe that Gu is already 10 years old. Or rather, it will be on May 17th! It was always been a cool brand – always worked hard to deliver style and great taste and just to make their job that much harder, their first product was a chocolate soufflé. Their attractive packaging and delicious chocolate have been the bane of many a diet, melting it into submission before a gooey centre of delicious chocolatey goodness. 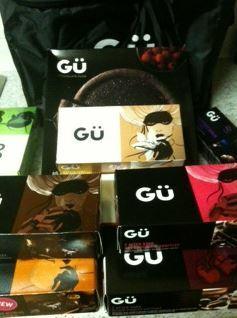 I was extremely lucky to be send a bag full of Gu Puds as part of their celebration of their major milestone. While I have reviewed some Gu, I have not tried them all before so I thought I’d talk a bit about the few I haven’t tried since, of course, you know all about the delicious chocolate shots, the wonderful cheesecakes and the amazing chocolate orange melting middles. 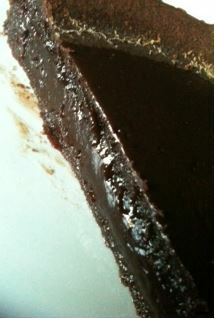 The Gu Chocolate Torte wasn’t what I was expecting. I can see how it is a blank canvass, waiting for you to paint on it with icing sugar, fruits, whipped cream and more. I can see the potential in the smooth, almost perfect top. The attractiveness of that dark chocolate torte that you can simply cut in to and serve with your own embellishments is great but I’m lazy 😉 so I microwaved naked pieces (I know – shocking!). I heated a small slice of mine up and absolutely loved it. 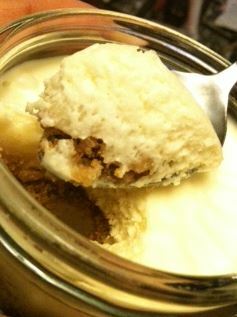 It was like a slice of melting middle Gu Puds from a giant pud. It was just amazing for flavour but what a paid to cut because of the thickness of it. Husband preferred his cold but we both enjoyed it. I’m not sure it is my favourite – I think that will always be the chocolate shots – but it was yummy. Mango and Passionfruit may not be chocolate but it is dessert because it is a cheesecake! Not too bad either – tangy and a sharp acidic fruit cutting through. These cheesecakes are large now but according to the booklet I got they were not always so as they are pictured quite small – like a chocolate shot size. Perhaps this bodes well for the chocolate shots then! The Black Forest Gateaux is probably the most different Gu I had in the box. While the cheesecakes have that lovely crumbly base with the layer of fruit and then cheesecake or just a lovely flavoured cheesecake, the black forest gateau had cake. That was not what I was expecting. They’ve used brandy and kirsch spiked Morello cherry compote, marscarpone cheesecake and chocolate ganache but there is also cake. So surprised was I by this that I forgot to take a picture! I’m not a massive fan of chunky fruit in my chilled desserts but this was actually a really great version of the classic cake (which I’m not a fan of 😉 ). If you love black forest gateau, treat yourself to this one. 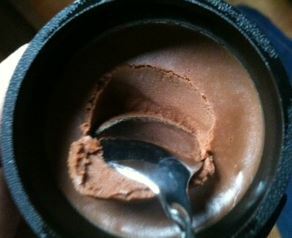 Oh heck – how can I not wax a little more lyrical on those delicious Gu Pud chocolate pots. I wish they were larger but alas, they are small (likely better for my waistline though). They are small shots of decadent thick goodness that just melts in your mouth. Kind of like Pierre Marcolini chocolate spread, only accessible… and not as high quality… and not single origin bean to bar… and not Belgian… but otherwise just the same! My favourites were the torte (cold was my preference as I loved the denseness of it that way) and the black forest gâteaux.